As the 40th anniversary of Earth Day draws closer, wind energy developers in Massachusetts are awaiting word from Interior Secretary Ken Salazar about a permit to proceed. Cape Wind, which wants to build the nation’s first offshore wind farm near Nantucket, earlier this month reached agreement with Siemens to purchase 130 turbines, a move praised by Massachusetts Democratic Governor Deval Patrick and Ian Bowles, the Massachusetts secretary of Energy and Environmental Affairs. 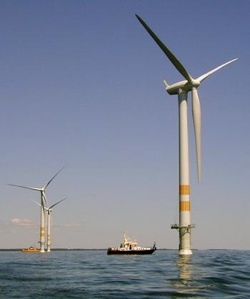 It’s difficult to see how the Obama administration, which pressed for more than $100 billion in clean energy investment in last year’s American Recovery and Reinvestment Act (the stimulus bill), would disapprove the Cape Wind permit. The project, though, has come under fire from the Kennedys and other prominent Massachusetts families. And the fight over whether to proceed has gone on for most of a decade. Like Michigan, some Massachusetts citizens and grassroots environmental organizations are fighting the advent of the clean energy transition with everything they’ve got. Massachusetts last year put a moratorium on wood biomass development pending the completion of an independent analysis of the risks that is due to be finished by June 1. And wind projects are not only opposed off Nantucket. Several more on Cape Cod have come under fire from citizens. In Michigan, meanwhile, offshore wind projects in Lake Huron and Lake Michigan have raised concerns, largely due to aesthetic reasons. And a state-of-the-art wood biomass plant has caused a small ruckus in Traverse City, where critics assert it will result in a “slaughter” of the state’s forest. Fuss disclosure: I am assisting the utility in its public communications and engagement strategy. Indeed, it’s not a proud moment for those of us who’ve been involved a long time and sweat the details of public campaigning, applying real facts, reason, maturity and pragmatism in struggles as important as the clean energy transition is to northern Michigan, the state, and the nation.